Simple and quick halwa that makes a great traditional dessert and also can be consumed during fasting. You can also make it beforehand and store in fridge and serve cold or after reheating. I prefer cold one, but if you don't want the frozen ghee bits, you can also reheat and serve. Also in this halwa, we will not use any condensed milk, but just regular full cream milk. I avoid using condensed milk in sweets, due to its very high sugar content. Also ready availability of regular milk is another reason. 1. Peel and grate lauki. Press with hand and remove the juice. Discard the juice. 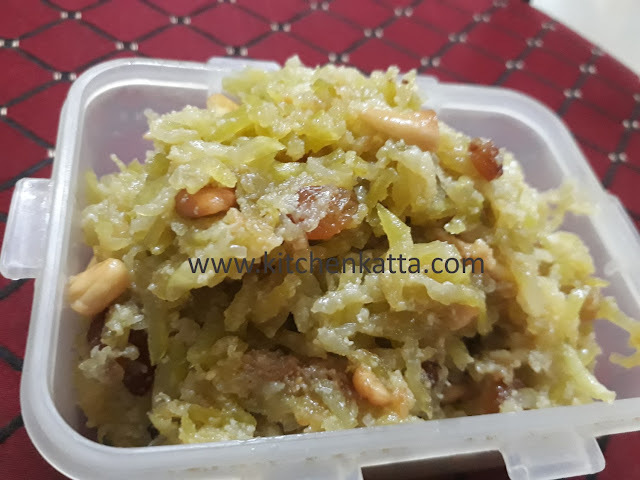 Grated lauki should now just be damp and no juice in it. 3. Now in same pan add grated lauki and roast it on low flame stirring continuously. After it becomes some more dry in another 3-4 mins, add the remaining ghee and keep roasting. 4. Once the lauki starts changing color and starts becomes translucent, add sugar and mix well. Serve hot or store in fridge for chilling! As a kid I always hated pulse, but now I realize how important they are for our health. This is very innovative. Thank you for sharing.